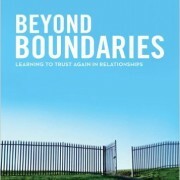 As with my review of Boundaries, I had read Beyond Boundaries: Learning to Trust Again in Relationships some time ago. I had held back posting a book review of it because I didn’t think that I was reading it for professional growth. However I realized that we have relationships in business that are sometimes more complex, confusing, and more difficult than other non-professional relationships. So I decided that you might like to know more about how relationships work and what you can do to improve them all. I believe firmly that trust lies at the very heart of all relationships. I remember organizations where the management team trusted one another and things worked relatively well – and conversely, where management teams quietly and secretly waited for a fellow team member to break their word – to violate a trust – so that they could point it out or publicly shame them. To paraphrase Building Trust, trust is the lubrication that organizations need to get things done. I’ve written reviews of three books directly related to trust (Trust & Betrayal in the Workplace , Building Trust: In Business, Politics, Relationships and Life, and Trust Me: Four Steps to Authenticity and Charisma), because it is so foundational to every relationship. There are two additional aspects of trust that Beyond Boundaries exposes. The first is the Hebrew word ‘batach’, which is most commonly translated as trust, but conveys a sense of carelessness. It’s not carelessness as in recklessness, but rather careless as in without concern. It’s this kind of trust that the author suggests primarily to expose an ability to be your authentic self in the relationship – rather than trusting that if you do things exactly right the other person will be tolerant of you. This has the ring of Authentic Trust from Building Trust but is a bit more complete and encompassing than the view expressed there. Its knowing that you can trust the other person as completely as anyone can ever trust another human being. The second is a breakdown between functional and relational trust. Functional trust, according to Townsend, is an alignment between what someone says and what someone does. Everyone has some level of misalignment between what they say and what they do – however higher levels of functional trust exist when the difference between the two is minimal. Someone who is known to keep their word would be said to be worthy of a high degree of functional trust. Relational trust is an ability to be safe with someone – exposing your vulnerabilities and feelings. In other words, it is awareness that you can be your real, authentic self with someone. Relational trust is about the complexities of trusting in a relationship. Knowing that there will be misunderstandings – but knowing the other party won’t willfully harm you. Trust is important, but truth – and biases – are important to relationships as well. Truth, as much as we may want it to be a single thing, is influenced by our perspective. One person’s hero may be another person’s villain. We all have biases from our background and from our perspective which influence our version of the truth. One of the most common issues with the “truth” is fundamental attribution error, which was discussed in Switch and in The Advantage. Fundamental attribution error is the tendency to attribute our behavior circumstances, and that of others, to character. We give greater grace to ourselves for making a poor choice because we can see the circumstances a bit more clearly. For others, we generally believe that they have a character flaw that made them behave poorly – even if the circumstances might have been particularly awful. Kurt Lewin described behavior as a function of both person and environment. That is to say that it is the two of these combined which will determine the action. For instance, if a loaf of fresh bread is in front of you, no one is looking, and you’ve had no way to feed your family – I absolutely expect that you’ll steal the bread (and feel bad about it). If I only told you that someone had stolen a loaf of bread, you might think less of them – until you realize there was no other way to feed their family. Certainly my point isn’t to condone stealing – my point is to expose the fact that none of us are safe from being a product of our environment. The fundamental attribution error is important in the context of relationships because we can consciously reverse the bias so that we give others “the benefit of the doubt.” In fact, research seems to show that couples in which one person has a slightly more positive view of their partner than the partner does of themselves tend to have better relationships. The better we are able to think positively about the other person in a relationship, the more likely that relationship is to be positive. No matter whether you reverse the fundamental attribution error or not, there’s some sense of a distorted reality around your “truth.” Of course, there’s our perceptual bias, but there’s more than that. The fundamental attribution error is a close cousin to confirmation bias: the tendency to find evidence to support our positions while ignoring evidence that would contradict our stance. The problem is that if you’re in a bad relationship – at home, with a boss, a subordinate, or a peer – you tend to distort reality if you decide to stay in the relationship. You’ll say that your boss isn’t really that bad or the subordinate doesn’t really make that many mistakes. This distortion of reality is necessary to survive in the relationship, but when the relationship ends, how do you deal with the distortion that you’ve created? The hardest part is realizing the distortion exists, since more than likely you won’t have even seen the distortion happening. You will have created a reality – a “truth” – around how you want that other person to be – whether that is who they are or not. One thing that wasn’t but could have easily been covered in Boundaries is the idea of different kinds of boundaries. Townsend asserts in Beyond Boundaries that there are two kinds of boundaries: defining and protective. Defining boundaries are the boundaries that define who you are and are immutable. That is, if the boundary changed it would change who you are. A boundary such as whether you would commit adultery may be a defining boundary – changing it might change your definition of who you are. Protective boundaries are provisional and will change as the need to protect yourself changes. If you need to protect yourself from verbal abuse, you might set a boundary that you won’t be with your mother-in-law except when your spouse is present. As you work with your mother-in-law to not be so critical, you can remove that boundary. Protective boundaries are like a scab over a wound. They’re there to protect the wound from further damage – and are designed to be temporary. I promised in my review of Boundaries that I’d be coming back to victimhood again. There are some key perspectives that Beyond Boundaries adds to the working definition of victim. Perhaps most importantly is the perspective that ‘you can’t outsource your health’. This hearkens back to the idea that no matter who created the wound, you’re ultimately responsible for healing it. It means that you have to take an active role in your recovery. You can’t turn it over to a counselor, a therapy group, a spouse, etc. ; you must take responsibility for recognizing your hurts and working on them. If you feel like you’re not heard at work, which triggers some deep feeling that you weren’t listened to as a child, it’s your responsibility to communicate clearly your thoughts in ways that are difficult to ignore – without being aggressive. For instance, if you didn’t feel heard in a meeting, you can send a follow up email about what you understood from the meeting and highlighting your idea that you feel didn’t get appropriate attention. Another poignant concept raised in Beyond Boundaries is that the process of grieving converts a wound into a memory. It removes the poison so the wound can heal. If you’re constantly feeling injured in a particular way, it’s possible that you’ve not completely grieved the situation. It’s an important part of being able to move on to grieve for a lost relationship. The other person in the relationship didn’t die – but the relationship might have. One of the interesting times that grief is appropriate is when someone gets a new job. Even when the job is ostensibly better in every way, the person changing jobs is invariably sad at the loss of friendships from their existing job. I mentioned in the review of Boundaries the tendency for rescuers to get caught up in others’ problems so much that they fail to look at themselves. So in Beyond Boundaries, I was triggered to think of Acts 20:35 – which says that it is better to give than receive. It occurred to me that this is the mantra of the rescuer. It’s better for me to give to others than to receive their care. However Beyond Boundaries hints at the idea that it’s better to give AND receive. In other words, giving is great, but if you never accept the care of others and if you never do self-care, you’ll burn yourself out. Similarly, we need to open ourselves up and become vulnerable to others. The only way to connect with another human is to open yourself up to them. So I’d say that it’s better to give and receive. It’s better to offer to listen to others and to offer them the opportunity to listen to you. The final nail in the coffin of victimhood is an integrated image of ourselves and of those people around us. Let’s focus on ourselves for a moment. Everyone has attributes that are great. They’re our strengths and our power. However, just as everyone has great attributes, everyone has poor attributes, parts of themselves that are perceived negatively by others or are self-limiting. There are no exceptions to this, everyone, no matter how great, can improve. One challenge is that the way that we view ourselves most frequently isn’t as one person who is powerful and vulnerable, special and normal. We tend to see one or the other of the two scenarios; rarely do we see ourselves as both at the same time. At the point at which you can see your flaws and your attributes side-by-side and allow them to exist in a single image of yourself, you’ll have conquered victimhood – and made progress on the way to being highly self-actualized and able to face whatever life throws at you. In terms of your relationship with other people, you’ll tend to see them as either all good (white hats) or all bad (black hats). It’s very difficult for us to see someone as great at work but not a very good community man. It’s hard to believe that a congressman who has done such great things for the community might be committing adultery on his wife – or at least it used to be hard to believe this. We tend to over-generalize information about a person into other areas. In viewing other people, we need to realize that competence or character in one area of their life doesn’t mean that they have competence or character in another area of their life. We can’t project their attributes in one area to another area. Are we human doings or human beings? While the answer should be human beings, we spend a lot of our time doing things. Part of that is a holdover from our evolution as a society. In early agrarian cultures we had no free time. As a result, we created a tendency to do things all the time. We rarely relaxed or took in what it meant to be a human being – instead of just the sum of the things we were doing. As society has shifted over the last 100 years or so, we’ve developed more leisure time. We’re needing to learn how to become more of the human beings we were created to be – to move past the always busy, always working, always engaged human doings that we had to be for so much of our history. 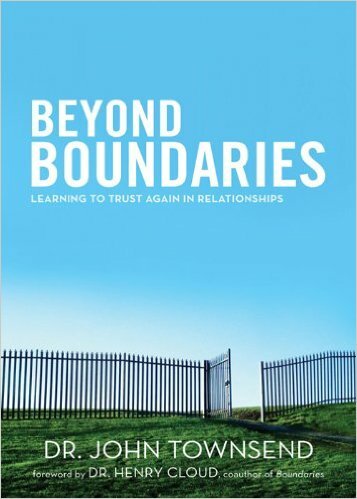 Beyond Boundaries may be just the book to help us with that transition as well as learning to trust again.